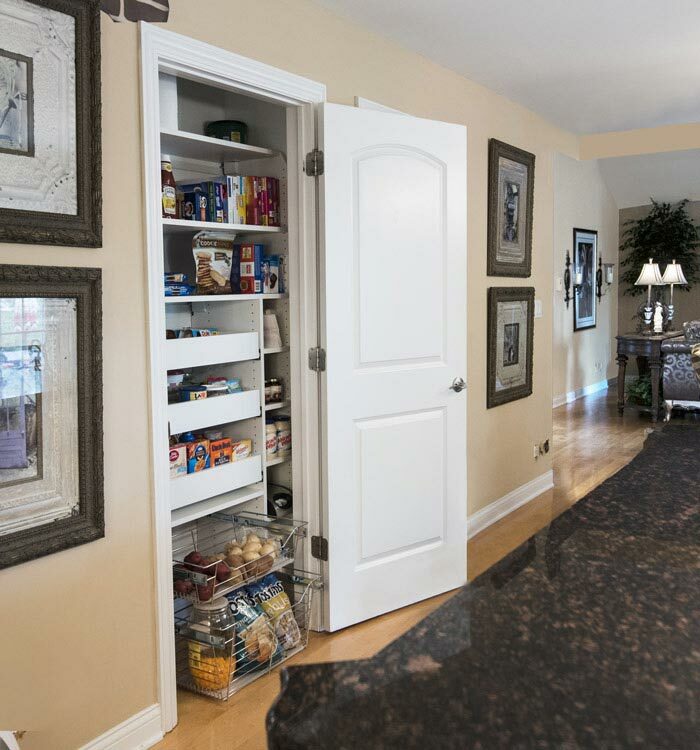 You don't need a huge, separate room in order to take advantage of all the benefits a custom pantry design provides. 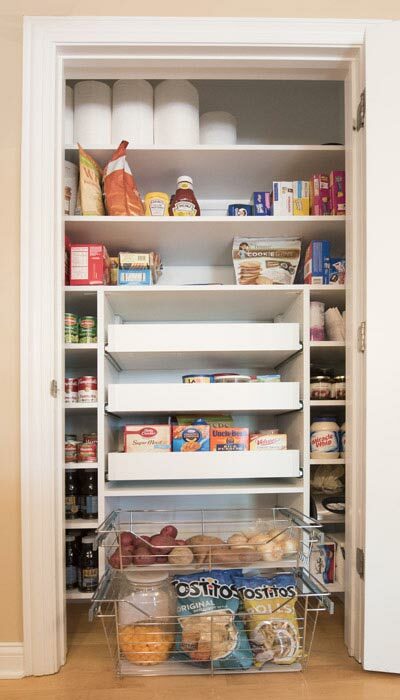 This pantry closet system is relatively small in size, but big on benefits! 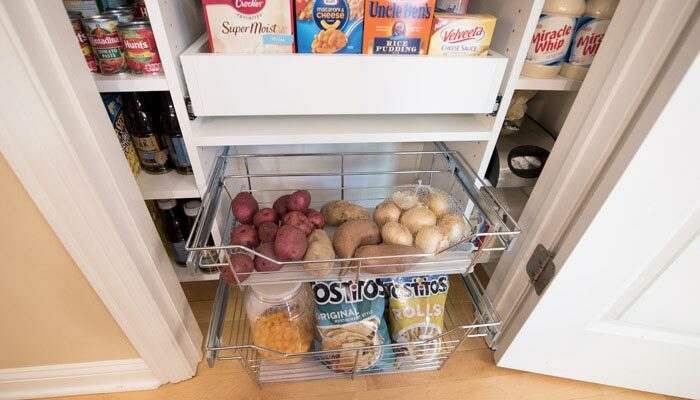 Not only does it nearly double the number of items that can be successfully stockpiled in the space, but it also provides easy access, making every square inch of this area count towards practical, usable storage. Every type of traditional food storage need, large or small, is taken under consideration in this efficient design. Upper shelves are spacious and allow storage for items such as cereal boxes and paper products (paper towel, plates, plastic cups, etc). 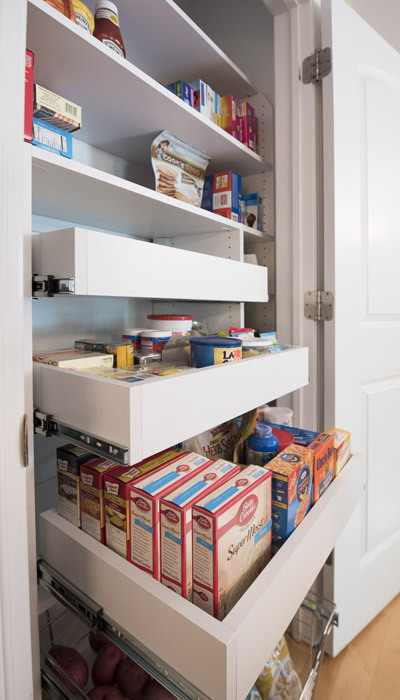 Pull-out pantry shelves give a crystal clear front and back view of all the smaller items, ensuring that nothing gets lost in the back. The nearly hidden, but easily accessible, interior shelves are perfect for categorizing canned goods, condiments, and fragile jars. 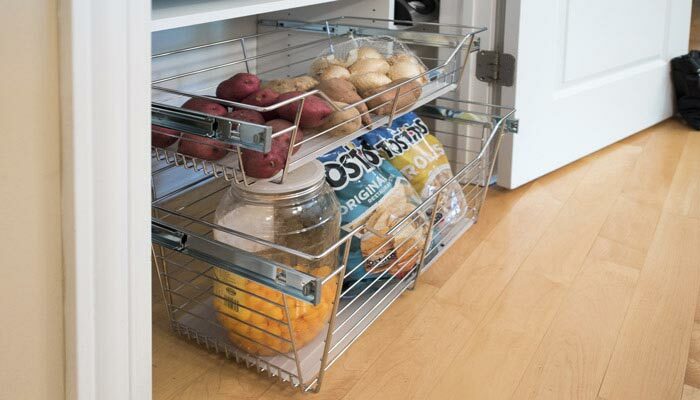 Chrome pull-out baskets are great for root vegetables and fragile snacks like bags of chips. The open wire design keeps air flowing and allows the chef to keep an eye on the cache of perishable items. The deeper baskets are perfect for storing snacks that are frequently packaged in bags that allow breakage unless properly stored in a basket like this — no one likes a bag of crumbs. Everything in this larder has a proper place and there will absolutely be no trouble finding that elusive, small ingredient that you absolutely need for your recipe and know you bought at some point.